A new report following the death of Anthony Avalos did not answer the question whether Anthony might be alive today had things gone differently, but it outlined important changes it says should be made to try to prevent a similar death. The report by the Los Angeles County's Office of Child Protection made eight recommendations to county supervisors Thursday. Anthony, 10, was abused, tortured and killed in June allegedly by his mother and her boyfriend. Both are charged with torture and murder. They have denied the allegations. The recommendations include lowering social workers' caseloads, providing more training and creating more collaboration between social workers and law enforcement. They echo similar calls from years ago following the death of 8-year-old Gabriel Fernandez. His death led to child welfare reforms, hundreds of social workers hired, and the creation of the very office that conducted this review. "I honestly can say from a systemic perspective that this case is very dissimilar to the notorious and awful 2013 death of Gabriel Fernandez," Former Judge Michael Nash, OCP director, said. The report says no fewer than 12 social workers were involved in Anthony's case, with frequent visits to the home and regular body and other checks of the children. County supervisors questioned, however, what more could have been done in Anthony's case, especially after the report says there were no calls about Anthony for 18 months even though there had more than a dozen calls before the boy died. "Was there ever a thought, 'Do we check up?'" asked Supervisor Janice Hahn. 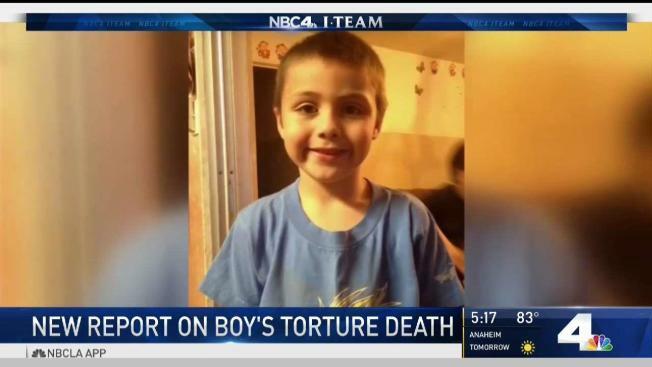 Anthony's was the third death of a child since 2013 who had contact with DCFS offices in the Antelope Valley. DCFS officials have been working to lessen caseloads and attrition in the Palmdale and Lancaster offices by adding staff and additional operation hours at medical hubs in that area, but admit more changes are needed. Officials also agree with one recommendation calling for more collaboration between social workers and law enforcement. "The true weakness here is us passing information from child welfare to law enforcement and there are a number of confidentiality rules around that," said Bobby Cagle, the director of the LA County Department of Children and Family Services. Maria Barron, Anthony's aunt, believes Anthony should have been taken out of the home. "They are just trying to minimize and say we did what we could, but unfortunately they did not do their job right," she said. The board approved the recommendations in the report. An update is expected in 90 days. The news comes after state officials said they will audit LA County's Department of Children and Family Services to determine whether it adequately protects children. Legislators noted that Anthony had been the subject of 13 calls to the department and that he may have come out as gay before his death. "Unfortunately, this is not an isolated incident," legislators wrote in their letter to the audit committee, saying the welfare agency could have prevented the 2013 death of an 8-year-old boy who prosecutors said was tortured and abused because a couple believed he was gay. The audit will specifically look into whether there are adequate protections in place for LGBTQ youth. The legislators also requested that the auditor look into whether the safety and risk assessments the agency performed are timely and accurate, and whether the investigations are thorough and leading to appropriate results. Court documents said Anthony was tortured, starved, beaten, dropped on his head and slammed into furniture by his mother, her boyfriend, and that his siblings were forced to take part, before he died in June. Anthony had been removed from his home for several months when some of the reports of abuse were investigated. He was returned after family members received in-home counseling, welfare officials said. Nash says cases involving "voluntary family maintenance" programs, where the child remains in the home while the families get services, are closed after the services are provided with no reviews. "Certainly, before they close the case and walk away from a family that is an essential piece that needs to be part of the process," Nash told supervisors. After Anthony's death, authorities removed the eight other children — between 11 months and 12 years old — from the home. They are being cared for by county child welfare workers, officials said. The previous review of county child welfare officials was conducted in 2012.